There’s an obvious fallacy, a selfish agenda to the prescription that can be found in the woods and secluded beaches. If the America public revolted against our vacation masters and went rogue. It we became independent travelers who once again slept on the ground and found our own way in lieu of setting foot on massive boats. How small 3.3 million acres of wilderness would become. The town of Gustavus swelling like a ballon and bursting as the masses flocked for the kayaks. The roads choked with car rentals, every Denali campground overbooked for years to come. In our lust for solitude, for wilderness, for our very roots, we eliminate any hope of finding it. There simply are not enough places left to support such a revolution. We are no longer capable of supporting such a demand, hypothetical or not. Parks and wilderness areas are little more than satellites, little havens like Yosemite, Denali, and Yellowstone where wolves still roam and enjoy their birthright. But step outside these sacred borders and watch the canine be transformed. From symbol of wildness to pest, thief, scourge of the rancher and hunter. Fur, teeth, and claws mutating into a species not to be revered, but controlled. Our opposable thumbs giving us sovereign right to rule. With so little acreage remaining, there is little choice for many but to blitz through with the concrete blurring beneath, the ocean rushing by ninety feet below. But in the end, tourism won over the traveler. It’s cheaper, easier, safer. Certainly the first of these doesn’t garner enough attention. Many feel that financially the great white boats are the only way they’ll ever have a chance to see Alaska. Some combination of frugality and an unwillingness to endure the hardships of traveling cheaply and independently. Unwilling to sleep on a paperthin air mattress beneath canvas when a mattress and the rumble of engines beckons. The limitations of oats cooked above the gas stove compared to the all inclusive all you can eat, all you can drink, 24 hour a day buffet. The prepackaged, lowest common denominator overshadowing the simple and sublime. But what do we come to Alaska for than? For the comforts of civilization? For floating casinos while the mountains cruise by? For bacon and eggs instead of oatmeal and peanut butter? Shouldn’t we be coming here to escape the familiar, the known, the comfortable? We have our whole lives to stay in pampered hotels, eat whatever we want, or play blackjack in Vegas. Hundreds of thousands of people migrate to Alaska every summer, their desire for the wild clearly not satiated. But something stops us short of truly acquainting ourselves at a deep, intimate, and personal level. How safe it is from the observation deck, where we can shelter when the wind gets too cold and there are no bears between us and the bacon. No worries, no cares, no magic. No John Muir epiphanies. The revolution will never happen, we are tamed, domesticated. Skyscrapers block out the sun, roads smother the forests. We walk on pavement until the grass feels unnatural, the sun foreign and suspicious after years under fluorescence. Reality TV to forget our reality. Too much time looking for 3G, not enough tranquility. Facebook over of travel books. Of course, we can’t afford to travel like this anymore anyway, so what’s the point of all this? To spend so much time prescribing a cure that people either don’t want or can’t have. I suppose it’s because every time I see a cruise ship pass by the lower bay I’m reminded of how much has changed, how there’s no going back. I feel no resentment towards those onboard, simply traveling the only way they know how. I know the alternative, the west Arm overrun with fiberglass, a line waiting to pass through the Beardslee Cut on the high tide making my stomach turn all the more. The great contradiction of the wilderness guide. Secretly hoping not too many people listen to what he preaches, knowing his church cannot handle such a congregation. “If everybody needed what you need, the wilderness would die.” Richard tells Kim Heacox in The Only Kayak. Glacial rocks, dirty socks, the paradox. Every spring the great migration resumes, animals of the sea and air swimming and winging their way north. In the recent decades a new species has taken up the route, plowing resolutely north with the hopeful promise of long summer days before retreating south as the waves build, the sun dims, and the rain pelts like daggers. Like the Arctic tern, many will shift their attention to the southern hemisphere, other rushing for the promise of lawn chairs, t-shirts, and mai thais of the Caribbean, following not the food but the money. The cruise ship has become the newest migratory species. But from May through September they reside in the Pacific Northwest, their roosts in Seattle, Vancouver, and San Francisco, their feeding grounds the towns of Juneau, Ketchikan, and Skagway, sustaining on a diet of generic cotton t-shirts bearing the ports name, postcards, and diamonds mined on the other side of the world. Many pass by quiet Gustavus, its dock offering no hope or promise of future ports, the town’s walls barred against such an invasion of 1500 people into a town of 350. To reach Gustavus is a deliberate act, an independent flight or ferry ride from Juneau. One does not wake up, stagger down the ramp, and ask where their tour is meeting. For most the true treasure is not in the town, but in the great mythical bay standing just to the west. Where 3.3 million acres of wilderness offers that many set out for. The open box on the bucket list begging to be checked (next year we’ll knock Europe off the list!). An Alaska devoid of t-shirt companies and concrete. This is the Alaska of John Muir and Jack London, wild, and free, an untamed land in an overdomesticated world. But from nine stories up, in a cabin bathed in artificial light, the heater blowing merrily, how tame it can all still feel. Like an low budget nature documentary the acreage glides past. Mountains, bays, and glaciers in a 13-knot parade. There’s no struggle against the tide or wind, no resigned paddle onward as every promising beach contains another Grizzly landlord. In the bay at 8, Margerie Glacier by noon, Icy Strait by evening. Eight hours, 65 miles, and on to who knows where. Never touching, never tasting, scarfing it all down as quickly as possible. Fast food tourism. Yet. Whether intentional or not. They’re here. The door to wilderness and the sublime left ajar. The cruise ship the keyhole with thousands elbowing each other out of the way to press their eye against it. To see, even if just for a day a sliver of the Alaska they’ve read about. And in that sliver, lies opportunity. To express that to see Glacier Bay is not the same as living it. Here lies one of the last places on earth waiting not to be changed but to change. To recreate us like the glaciers did. A reminder that we are never complete. That like a river of ice, constant motion is necessary. That are own natural succession is always in progress. That it’s never to late to surge like like the Grand Pacific Glacier hundreds of years ago, charging south as fast as a running dog. All we have to do is let it. Many will glance through the keyhole, snap a photo, shrug their shoulders, and move on. But for some, perhaps a cruise is the first step, leaving them in awe, thirsting for more, something authentic. Those eight hours will leave them wanting to meet the bay on its terms, on its level, from the seat of a kayak, at the feet of the glaciers, discovering their inner Muir. If they return it’ll be on their own journey of self discovery, with a can of bear spray in one hand and a tide chart crumpled in the other. And when they return to the bay, it won’t be by accident. Paddling in a double kayak is about rhythm, matching your stroke to your partners. The rise and fall in perfect synchrony: dip, push, pull, lift, switch. After a while it becomes meditative, the landscape and hours slipping by, the sun slowly pivoting across the blue sky. Feet in front of me Brittney sets a steady pace, the kayak’s bow cutting silently through the Beardslee Islands, briefly disturbing the calm surface of the ocean before the ripples dissipate, covering our tracks. Eight inches below the water is glass. It’s surface reflecting the islands, the mountains, our very being back at us with the distortion of refraction. Twisting our reality ever so slightly but no less authentic. We cut across the mouth of Secret Bay and jut briefly north along the Young Island Peninsula. Strawberry Island stands at the mouth of the Beardslee Entrance. The gateway to a maze of homogenous islands. The birds eye view of our maps reveal their distinctive points, coves, and bays. But when you paddle within them, their uniqueness vanishes, replaced by gradual rocky beaches leading up to forests of spruce, hemlock, alder, and cottonwood. Weaving through, it’s easy to imagine getting lost in a land of identical land masses that punctuate the water ways. Easy to get confused in a sea of conformity as you try to match the point on the map with the four similar ones you just paddled past. But by the time we reach the entrance it all becomes clear. The lower bay leaps out from behind the islands and my eyes follow contours of the land north where the glaciers lay, advancing and retreating, never sleeping. You could spend years studying the geography of the bay and never know all of it. The price you pay for living in a land that is constantly changing. From the other boat Leah points toward a small cove that overlooks the entrance, the sun warming the rocks. I push down with my left foot and the boat concedes to my request, the stern swinging right. A few hours ago we’d slipped through the cut on an uninspiring 10-foot high tide using the back door to slip into the Beardslee’s. In places the keel of our kayak whispered as it kissed the blue mussels and barnacles barely submerged at the high tide. A few years ago our boat would have safely passed through on a ten foot high, but with the land rising at three quarters of an inch per year, nothing can be taken for granted here. Maps routinely became obsolete within years, riverlets between islands viewed within varying degrees of suspicion, nothing was real until you’d paddled it, seen for yourself how much the bay had truly changed. Our boat kisses off the rocks on the ebbing tide as we stretch stiff legs and backs like an old man rising from his favorite chair. A curtain of reed grass four feet high stands like a fence at the top of the beach. We stop and scan for a moment to see if our landing has stirred up a pair of black ears attached to a tan muzzle, but all is quiet save for the chorus of the birds, and the steady drone of a boat as it chugs north through Sitakaday Narrows, sharing the sound with the lower bay. Names rattle off my tongue like long lost friends; Tlingit Point, Drake Island, Geikie Inlet, Marble Mountain. Somewhere above them are the glaciers of the west arm where undoubtedly, a pair of cruise ships throws wakes onto the beaches as they churn through Tarr Inlet. It made me sad to think about. How much of this place can’t be experienced from ten stories above. Isolated, withdrawn, with controlled heating, air conditioning, buffets, casinos and gift shops. But how many really did want to take a big drink of the land? Run their hands over the rocks, feel the laughter of the waves as they played with your boat, hear the Sea Lion roar, the Oystercatcher giggle? Unless things had changed drastically in the past few years, not many. So we talk about what we can control, the people that do want to take a drink, see their reflection refracted back on the mirror of the ocean. Leah talks about finding common ground, guiding is more listening than speaking some times. It’s true, the climate change pharisee, the six figure oil employee isn’t the padding type. If they were they probably wouldn’t be what they are. From the mouth of the west arm comes a great white monster, a cruise ship materializing, even dozens of miles away it plows south like a great floating skyscraper. In the fall Leah travels to Canada and leads polar bear viewing trips. It is here, that she must fight to find common ground, to listen instead of speak. I feel cynicism and frustration rise in my chest. 70% of Americans claim to support environmental policies. But we’ve elected a congress that hasn’t passed a conservation policy in years. Save the world. As long as it’s convenient. I look back into the Beardslee’s the route we’d taken hidden and concealed by the optical illusions of dozens of points, coves, and forests. Every island looking the same, but in actuality so different. The cruise ship grows larger, on board are thousands of people that look just like us, perched on the rocks. Perhaps that was the challenge, the goal of the naturalist and conservationist. To stop looking from above at these people where every difference was so obvious. To stop looking at the map of the Beardslee’s as it were, and to actually paddle it. So that we could both see that, we weren’t all that different. For my entire life I’ve been blessed to live in a place that other people visit. Not the Bahamas, or southern California, or Europe; Alaska. The Last Frontier, Land of the Midnight Sun and whatever other catchy tagline we’re using these days (Palin’s Pasture?). For three summers I had a front row seat to those retracing the routes of John Muir, the gold rush and sled dogs. I worked in Alaska’s capital, Juneau as a whale watch guide, deckhand and bear guide (bear viewing that is, not hunting). I was fresh out of college, and had just had the rug pulled out from underneath me. I had lined up an entry level position with NOAA (National Oceanic and Atmospheric Administration) only to have the federal budget frozen and my position unceremoniously tossed out four weeks before I was supposed to begin. I didn’t know the first thing about guiding. But I knew whales, the ocean and my Dad had once been charged by a Grizzly so I felt qualified. 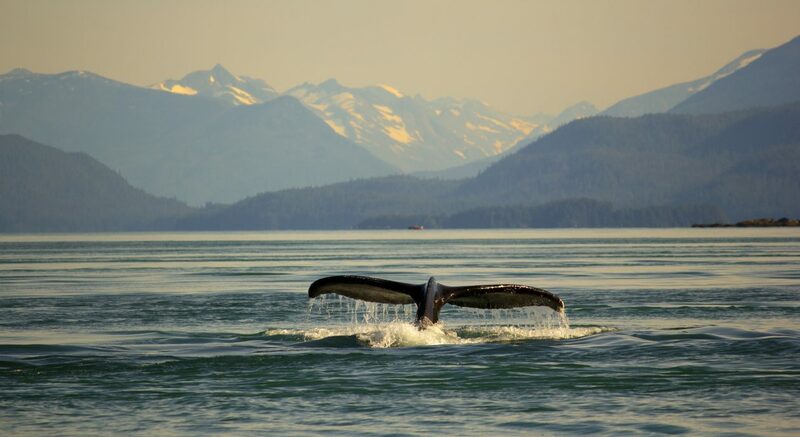 Virtually the entire tourism industry in southeast Alaska centers around the cruise ship. The 2,000 passenger floating hotels that market themselves as holding everything you could ever want. Upwards of 15,000 people can flood Juneau off the boats in the summer; a town with a population of about 33,000. I fidget on the dock. Bright orange polo tucked into Carharts, black and orange ball cap jammed on top of curling blond hair. I feel like a 6’4” carrot. Slowly couples begin to gather around me; from Germany, Texas, Boston, and Australia. I hand out the weight sheets to ensure the planes are balanced for the flight portion of the tour and try to make conversation. A beer or two would’ve helped. My last couple staggers slowly down the gangplank towards me. It’s immediately clear that all is not well. The husband’s steps are uneven, his breath ragged, he looks exhausted and beaten. Cancer will do that. As we board the bus bound for the airport his wife pulls me aside. Yes, her husband was terminally ill, his life expectancy could be measured in months. But if I could, please, try to treat them as normally as possible. I climb the steps behind her and collapse into my seat mind whirling. I was supposed to be in a lab, or a research boat measuring the bioenergetics of forage fish. Fish that couldn’t tell me their physical condition. That there last wish was to see the glaciers of Alaska. What the hell had I gotten myself into? What did this man care how big a humpback whale was? How long a brown bear slept or how much fish they could devour in a day? The trip slides by as the plane sends us over the glaciers and over to an island called Chichagof which has one of the largest concentrations of brown bears in the world. Naturally we see none. Nature doesn’t understand the concept of the storybook ending. In the small native town of Hoonah, a boat collects us and we begin the three hour trip back to Juneau eyes scanning for whales. Slowly I begin to pluck up the courage to talk to him. His name is Dan, he’d lived his whole life in Houston, Texas and had just been diagnosed a couple of weeks ago. He’d rejected chemotherapy and other treatments, emptied their bank account, and was seeing as many of the places he’d dreamed of experiencing before the sickness shackled him to a bed. Alaska had been his number one pick. Juneau had been their boats first stop. “No pressure,” I told myself. I apologized that the bears hadn’t shown, that the glaciers had been partially obstructed by clouds. He shrugs, “it’s just enough to know that I’m here.” he answers. Twenty minutes later a humpback blasts out of the water like a rocket, sending a crescendo of foam across the surface and we cheer like our team just won the Super Bowl. There’s a spark in Dan’s eyes, a glint of joy and life that I can still see four years later. For a few seconds he looks reborn until another coughing fit sends him back into the boat’s cabin. An hour later we’re within sight of Auke Bay, Juneau’s largest harbor. From the water, the Mendenhall Glacier looms over the boats bobbing along the dock. Even from two miles away it dominants the skyline like a giant frozen sky scraper. The boat captain screams the boat to a halt and ushers me onto the deck with Dan and his wife. “Get their picture with the glacier,” he whispers. They lean against the boat’s railing, the ice framed perfectly above them. I swallow a lump in my throat and blink away tears. For the second time Dan looks half his age as he dots a kiss on his wife’s cheek and wraps an arm around her as I click off a shot. The moment passes, the boat revs, and they slowly move back inside, wrapping their down jackets tightly against the wind. Minutes later we’re on the bus, headed for the cruise ships 15 minutes away. I search for something comforting or inspiring to say. Some magic words that could somehow make their plight better. Instead I just listen as they talk about their kids, their work, their life. My ears doing more than my tongue ever could. I confess that I’ve never killed anything bigger than a salmon. “Well don’t wait,” he said, “live out your dreams while your young, don’t wait for your come to Jesus moment.” His wife sniffs and he gives her a little squeeze. The bus stops, I shake Dan’s hand and hug his wife. Slowly they walk away, inching up the gangway, his last words echoing between my ears. Don’t wait, live now. See what needs to be seen. Breath the air, walk the trails, climb the mountains, swim the rivers. Don’t let life get in the way of living. Four years later I sit in a cabin perched on the shores of British Columbia, living. NOAA never called back, hallelujah. Maybe I’ll get a real job some day but I doubt it. Not after seeing that look in Dan’s eye as the humpback broke the surface, telling me everything I’d ever need to know. The email was terse, to the point, and completely unhelpful. NOAA, after offering me a job upon my graduation from college in three weeks, was withdrawing their offer, citing a lack of funding. Fear courses through my blood, my knees weak, I reread the email, sure that I’d missed something. I hadn’t. It has to be one of the worst responses ever to the question, “when’s my first day?” I grab the phone and call the ladies office that I was, in theory working for. As the phone rang and rang I mentally calculated the deposit on the apartment I’d just put down and my bank account with a number that Bob Cratchit would be embarrassed by. For the next two days I wrote emails and left messages at the office, trying to get someone, anyone to return one, to explain what had happened, to give me any direction. I’m still waiting. Things were going so well too, I’d gone to college, met the girl I’d marry, and had the, “get a job” step all figured out. I was going to graduate and work for NOAA, at least to start, make some money and than go to grad school. Well on my way to a nice respectable, safe career. My job, measuring the bioenergetics of herring. I’d even talked myself into being excited about it. Studying whales, well, it’d been a nice dream, but it was time to be realistic I told myself. Time to grow up. There can only be so many Paul Spongs and Alex Mortons in the world. After three days of blind panic my heart rate slowly returned to normal, I began to think rationally again and deleted all those terrible emails I’d written but thankfully never sent. Life was going to take a detour, just a small one I told myself. I needed work, and I told myself not to be picky, just find something to keep a roof over your head. And in that process I learned an incredibly valuable lesson, no job is beneath you, and just because you’ve never thought about doing it, or don’t think you can, doesn’t mean you shouldn’t try. I applied everywhere, restaurants, pizza delivery, tourism, I even swallowed what pride I had left and dropped an application off at Fred Meyer, the same place I’d worked after my freshman year of college. I felt like I was being pulled backwards. What happened next you could call God, or the universe, or karma, or just boring old luck. I landed the job I think I always wanted, was meant to have, I just couldn’t admit. I was going to be a whale watch guide. Looking back it seems so obvious, such a natural route for life to take. But I was pulled into the American obsession of careers and security, my life filling up with, “had tos.” I had to have a year long job, I had to start saving money, I had to buy a house, I had to have a job with health insurance, all these things I had to have. And I’d bought it, swallowed the sales pitch, and had believed it my whole life. And I still did even after landing the job that paid me to watch orcas breach and humpbacks bubblenet. My destiny, I told myself still lay in herring bioenergetics. My clients encouraged such thoughts, a nice young man such as myself needed a real job eventually, needed to make something of himself. This whale watching thing is ok, just for right now. But by the time I’d pulled into the parking garage and dug out my rain jacket I’d decided; it wasn’t the life I wanted. I could do without the lab coats because I new, deep down, I couldn’t possibly be happy with one on. In five minutes there’d be twenty cruise ship passengers, looking up at me, expecting the answers to all of their Alaska questions, and I couldn’t even answer everyone’s first personal question, what’re going to do with your life?